This slow cooker chocolate chip cookie cake is the perfect dessert for any celebration! For a twist on your typical cookie cake, we bake gluten free chocolate chip cookie dough in a slow cooker to gooey perfection and serve it warm with vanilla ice cream. 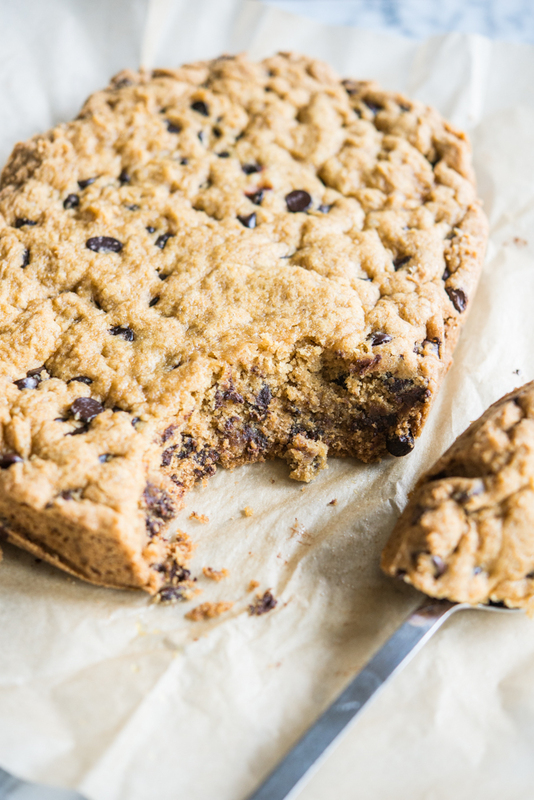 This slow cooker chocolate chip cookie cake is everything you never knew you needed in your life. This recipe first came about when we were thinking of an easy crock pot dessert that we could bring you. We went through the usual cobblers and dump cakes, but then we had an idea – what about a warm, gooey, gluten free chocolate chip cookie served up with vanilla ice cream? Um, yes please. This cookie cake takes me straight back to the days of eating Pizookies from BJ's in high school. The pizookie would come to the table hot from the oven, with a slightly undercooked center, and ice cream melting over top, and we'd all happily dig in. That's how you can think about this cookie cake- except, unlike the Pizookie, it is perfect for a big crowd! 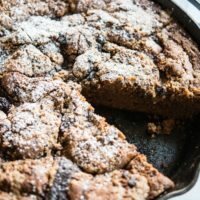 Why make a slow cooker dessert? 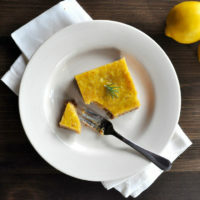 I've always been of the mind that the slow cooker and Instant Pot are best-used for making soups, broths, and big, shreddable proteins, but it is also a great candidate for making a large dessert that you want to keep warm. This chocolate chip cookie cake would be the perfect dessert for a summer BBQ. You can make the dough ahead of time, press it into the slow cooker once your guests arrive, and then by the time everyone has finished their meals, they can serve up a warm piece of cookie cake whenever they're ready! 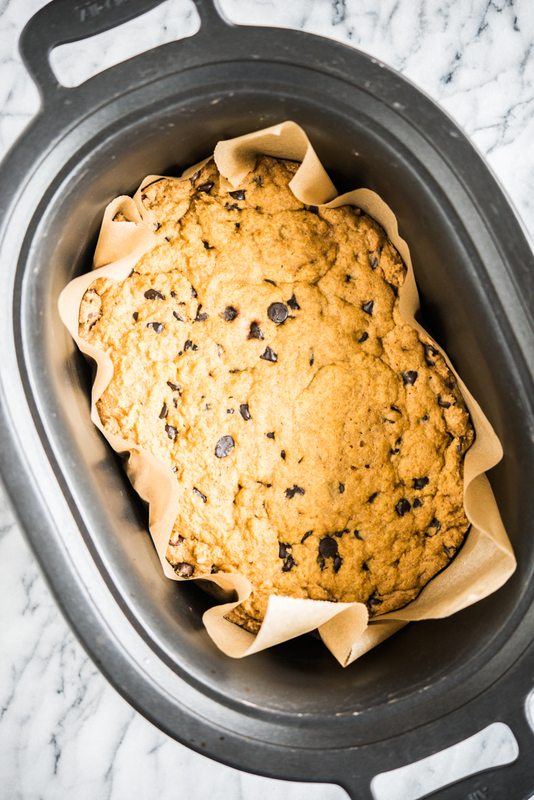 The other advantage of a crock pot dessert is that as we move into the warm summer months, you can avoid turning on your oven! Making this cookie cake truly could not be easier! 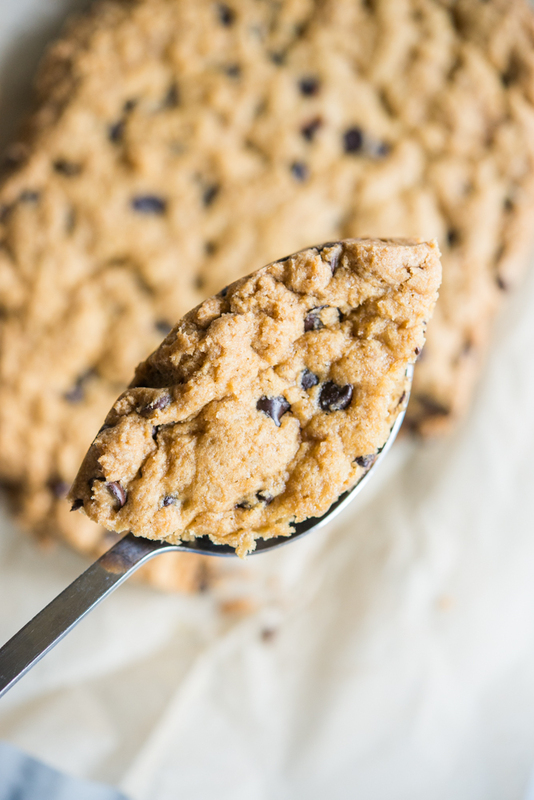 We've given you two options for your cookie cake – a gluten free, nut-free chocolate chip cookie and a grain-free, Paleo chocolate chip cookie. 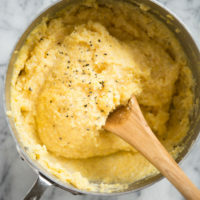 You'll simply make the dough the same as you would for any cookie, then you'll line your slow cooker with parchment paper, press in the cookie dough, and set it to high to cook for 2 hours. Once the edges and top of the cookie cake are slightly browned, and the center is still slightly soft, you can switch the slow cooker to warm until you're ready to serve. We highly recommend serving up this cookie cake with vanilla ice cream, and maybe even a little melted chocolate! 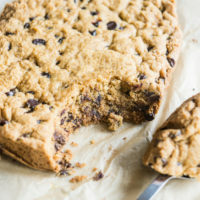 If you'd prefer to bake the cookie cake: press the dough into a 9×13 inch pan and bake at 325 F for 45-50 minutes, until the edges and top of the cookie are browned and a toothpick comes out clean. 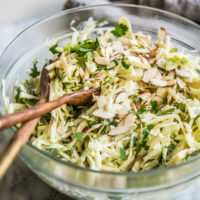 I just tried the grain-free recipe and wow, this is delicious! I have never used the slow-cooker like this. At first I didn’t think the cake would set, but it did. What a great idea, thank you! So glad you liked it Elisabeth! Can you sub ghee for butter? Yes, you can absolutely sub ghee for butter! Do you provide nutritional values for this or any other recipes? !